I had a little mini vacation this past week visiting family. In those moments of down time I often find myself reading, reflecting on where I’m at, how I see myself etc… Just before leaving two separate clients had commented to me about some organizing my business partner and I had done for them. Their comments were reminders that I do indeed have talent, see things in ways others don’t and am good at what I do. While I love getting those kind of comments, I am going to be honest and tell you it is very hard for me to accept those kind of compliments. I rarely see myself as skilled or good at something. I am most often my own worse enemy and critic. What a shame. If you have been following my blog you know I am revisiting the Proverbs 31 woman, as I do once each year. In the process of revisiting those scriptures I always learn something new or am challenged in new areas. This year, seeing myself for who I am, being the person God created me to be, has been the recurring theme and place of discontent and conviction. This woman of God was strong, physically, mentally and spiritually. She put much effort into her daily living, seeking to fulfill her purpose. Who she was, was so much more important than what she did. I am reminded she was confident. Not in a haughty way, but in a wise way. She feared the Lord and praised Him with her hands, her words, her actions, her concern for others. She accepted who she was and set out to live for Him. Her example reminds me I am to embrace the person I am, the way He created me to be. It is sin not to. To belittle who I am is wrong. I am not to be haughty or confident in my own abilities, but I am to embrace the gifts and talents He has given me and set out to use them for His purposes and His glory. 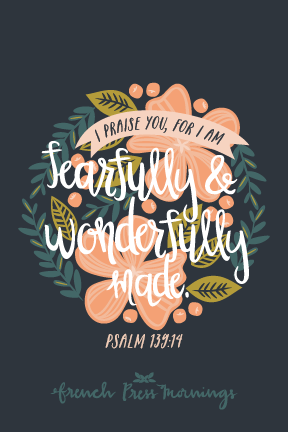 If you have been struggling with doubt or have a tendency to be your own worse critic, look back at the Proverbs 31 scripture and ponder over Psalm 139:14. You are unique. There is but one you and your purpose, your talents and gifts do not match anyone else’s. You have purpose. Be glad. Rejoice in who you are. Embrace all that He has given you and commit to use it for His glory.